SOAPware DocumentationSOAPware Cloud Service (SCS)SOAPware Cloud Service (formerly SHS) FAQ'sQ: How do I print from a Remote Desktop Connection (RDC)? A: Provide a list of the printers in the clinic to the Support Team at SOAPware. The Support team will then install the print drivers on the ASP server to make the printers available from the server. You may submit this information in a Support ticket at www.soapware.com/ticket. 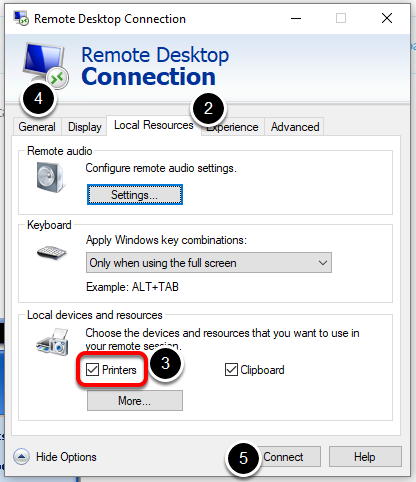 After this step is completed, the option of "printers" must be selected on the Remote Desktop Connection. Log in to the Remote Desktop Connection. Click on the Local Resources tab. Click to place a check in the box next to printers. Click on the General tab and enter your log in information. 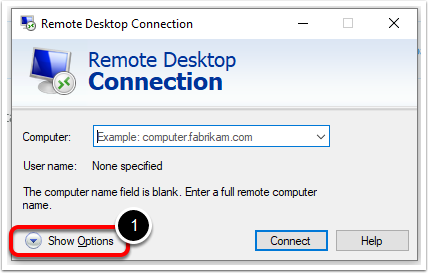 Click on Connect to connect to the Remote Desktop. Previous Lesson: Q: How do I connect to the SOAPware Cloud server? Next Lesson: Q: How does a Remote Desktop Connection "Session" work?